Summary: Adam’s small town life in Eden Mills, Ontario is turned upside down when the world suddenly finds itself without electricity thanks to a rampant computer virus. Plunged from the twenty-first century back into the nineteenth century, life quickly becomes about physical survival, providing for his family’s basic human needs as his father is stranded in Chicago. With the help of his mother, the police captain, and his mysterious former federal agent neighbour Herb, Adam plays an important role in the reorganization of society, dealing with new concerns and dangers that their situation brings. Review: As the world descends into primal motivations, Adam is a sixteen year-old who takes on a new leadership role and responsibilities when he refuses to give up his values and consider the survival needs of the community he lives in. Under the guidance of his neighbour Herb, a man who has intimate knowledge of the dissolution of society, Adam proposes the villagers of Eden Mills stick together and pool their resources to save everyone and plan for a future without electricity through farming. Author Eric Walters ponders the question, What if the world were suddenly without electricity? and weaves a thoughtful tale about what such a world would be like. Interspersed with intense action and a touch of romance, Walters crafts a community that strives to keep their moral centre in spite of the breakdown of society as they know it. I appreciated the conversations between Herb and Adam as they discussed the philosophical repercussions of their decisions in a world suddenly focused solely on physical survival. I hope this is the start of a series, because I want to know what happened to Adam’s dad and I wish there was a better reason for the attack of the new military on communities just trying to survive. Walters highlights the struggle for power in a new world order, and it isn’t quite clear by the end who will be victorious. Will anyone figure out how to fix the computers and get the world’s infrastructure back up and running? But if they do, have things changed too much for society to recover? Walters has given me a lot to think about, and reading his book has given me insight into how society works and is maintained. He could see from my expression that I had no idea what he was talking about. ‘It’s simple. The way people act, what they believe is wrong or unethical, changes because of the situation. None of those men woke up today thinking they’d try to steal a beat-up old car from a kid and an old man. Things change, especially when a mob mentality sets in,’ Herb said. 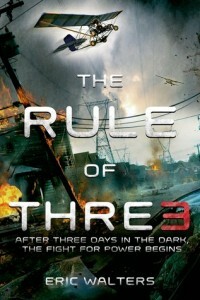 The Rule of Three by Eric Walters is published by Razorbill, (2014).